This is the typical Spanish paella. 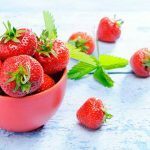 This recipe is the best known one throughout Spain and is prepared with a tomato, pepper, onion and garlic sofrito. Water must be measured well for this dry rice dish to be sure that the rice doesn’t become overdone. Specifically, if you want to prepare paella, use two glasses of water for each cup of rice. Rabbit is the premium meat used for this dish. If you come to Andalucia, try it with a good red wine, the perfect combination of Spanish flavour. This is the typical Sunday paella in Spain. People often sunbathe in the countryside and make this recipe with chicken for their family. It is very important to add a good amount of black pepper and paprika so that the meat will absorb the flavour, in addition to red peppers and peas. It is always a good idea to cook this variety and if you come to Spain, make sure you order a dish with an accompaniment of olives. A perfect plan for eating out on weekends. This is one of the recipes that best define Mediterranean cuisine. 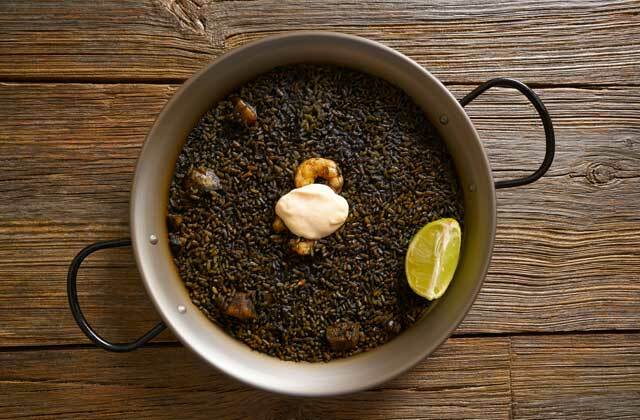 Also known as paella marinera, it tastes like iodine thanks to the seafood which gives you a taste of the ocean. It is usually prepared with squid, prawns, mussels and clams. It is one of the most popular dishes in coastal areas and, in summer, it is very commonly eaten on beach bars. You can’t visit a beach in Andalucia without trying the seafood paella. Mixed paella combines two flavours: Meat and seafood. It is also one of the most popular dishes and is usually cooked in every house. It is made using the meat sofrito and then adding squid and prawns. 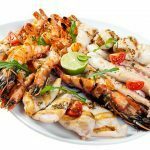 It has a very strong taste as the tender meat takes on the flavour of the seafood. Perfect for eating out at any restaurant, this dish never fails to impress. This variety is typical, especially in Galicia. It looks totally different from the rest, because the rice becomes black due to octopus or squid ink. 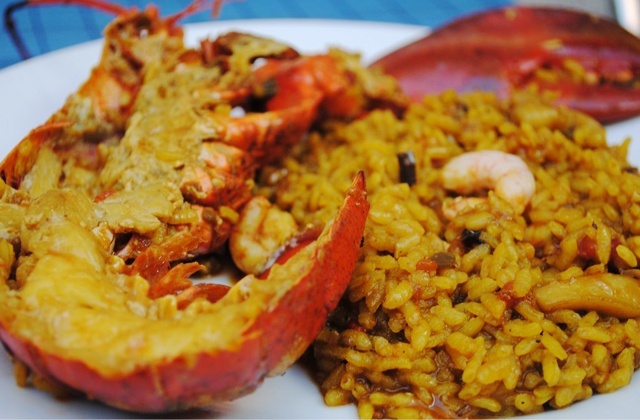 The ingredients are the same as the seafood paella, but this additional affects not only appearance but also the taste. This characteristic has made this recipe one of the most sought after thanks to its originality. 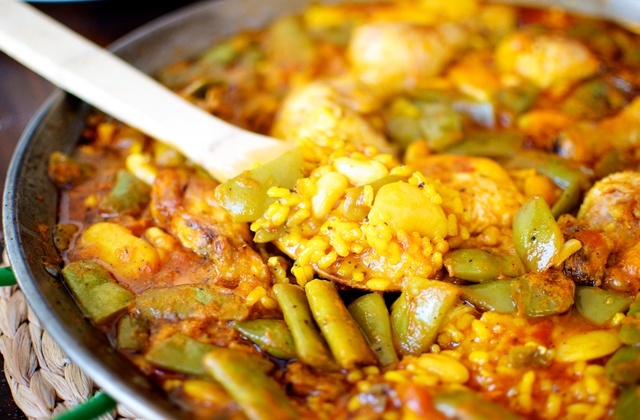 If you like strong tastes in your mouth, this is the paella for you; give it a try! White paella is very simple dish to make which, nevertheless, achieves excellent results. 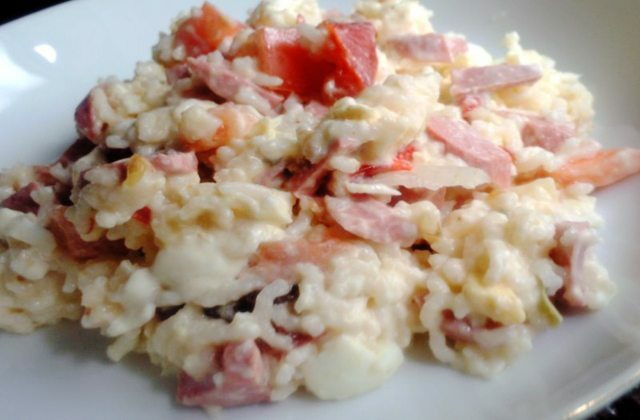 The ingredients that accompany the rice this time are ham and salami. These are mixed without adding colouring, giving the dish a white appearance. A very typical variety in eastern Andalucia, it is usually served on many occasions as “tapas”, accompanying a beer or a summer red. This variety, with its original recipe, was created mostly due to vegetarians. 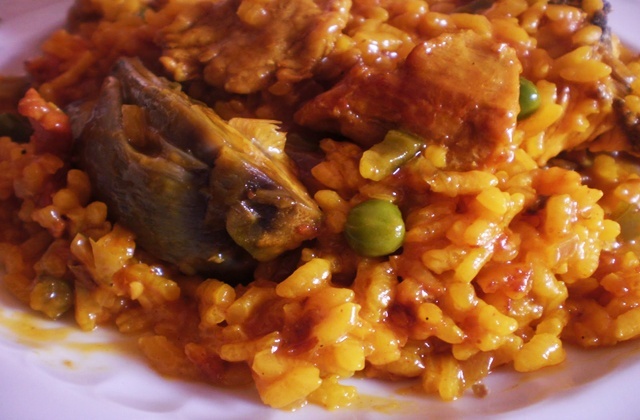 There are a growing number of people who refuse to consume animals and who have opted for this type of recipe so as not to refuse the typical Spanish dish. The basic ingredients are: artichokes, asparagus, mushrooms and olives. It’s a different combination which doesn’t detract from the original dish and you can try if you fancy a light lunch. 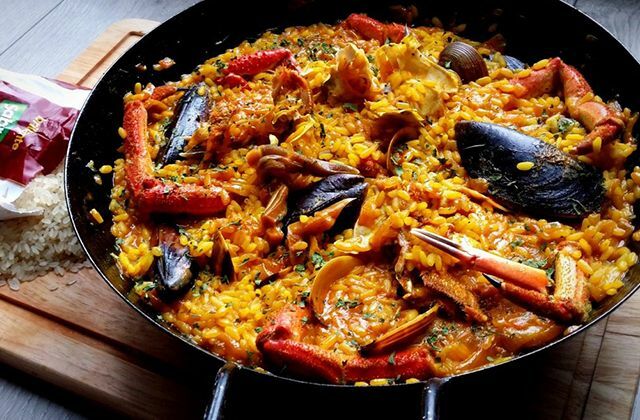 Although it may be classified together with seafood paella, its unusual flavour sets it apart. 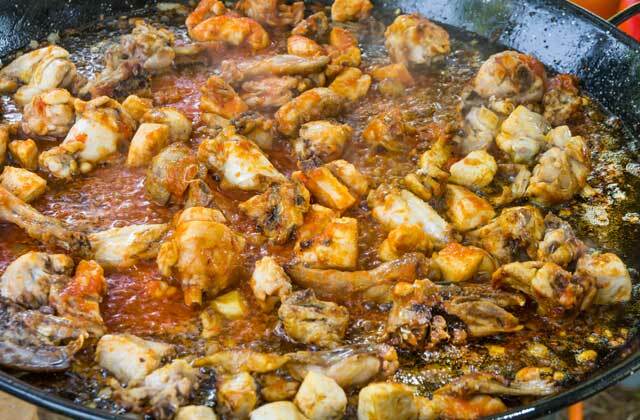 This is a very much sought after recipe which is cooked often in Huelva, becoming one of the top dishes. This province is well-known for its seafood and this variety is not usually mixed with other ingredients. If you come to this area, don’t forget to order this delicious treat for your taste buds. You won’t regret it. 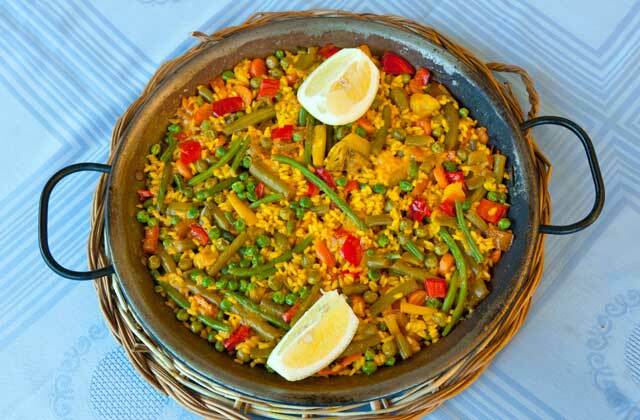 This paella is harder to find in restaurants but in coastal areas, it is often prepared upon request. Lean pork meat is used instead of chicken or rabbit, which gives a completely different texture from the rest. Part of the secret in this recipe is also beer which is added when frying the onions. The alcohol evaporates after five minutes but leaves that taste of barley soaked in rice. An interesting dish, it is served most often in summer. Paella is really a different way of cooking rice. This ingredient is loose and dry, which is the essential part of paella. Although this is the main secret of this Spanish culinary treasure, the positive thing is that you can cook it in a thousand different ways. 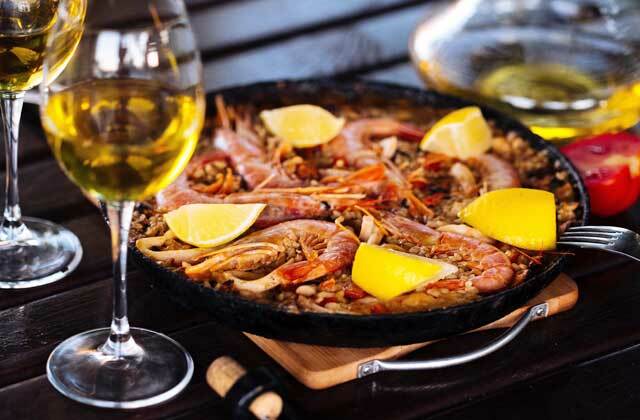 Although some recipes are widespread, you can make paella to your own tastes. The rice absorbs the flavour of any ingredient you add, and you can mix as you please. 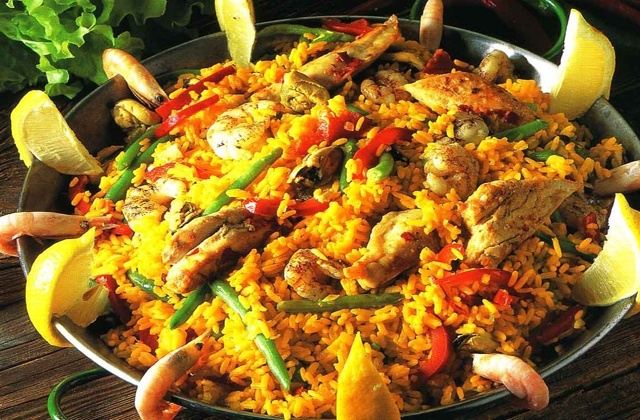 There are many restaurants which allow diners to choose what items to include in their paella. As such, if you come to Spain with very specific tastes, add them to this dish and it will give you fond memories of good Spanish cooking. 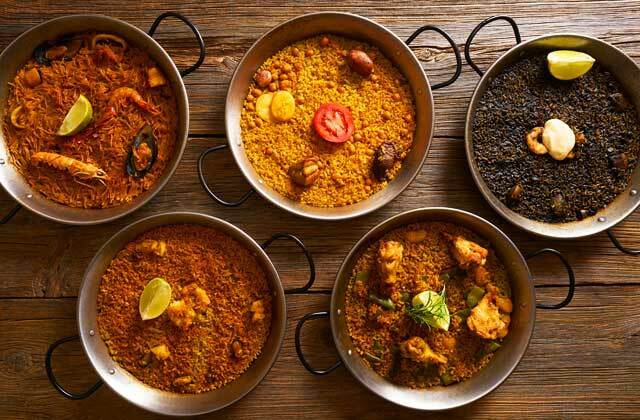 If you are thinking to get away to Spain, try out its star dish. You can try all the varieties we mention above, especially in coastal areas. 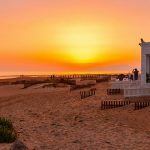 Southern Spain is without doubt a privileged destination. 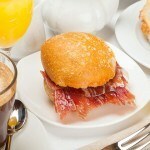 If you want to try a good Spanish restaurant, Andalucia has a wide variety. 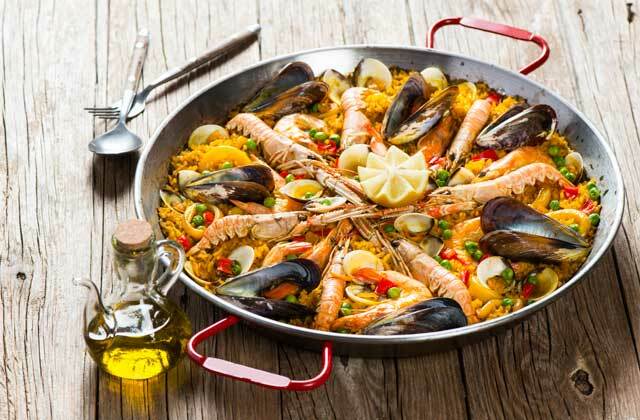 Paella is a dish par excellence which you can eat mainly in coastal areas, accompanied by a cool drink in the sun which bathes the Mediterranean. 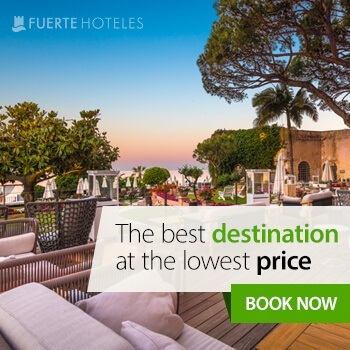 If you like the sound of this, we recommend you stay at Fuerte Hoteles. Hotels and apartments with excellent service and quality according to Tripadvisor, and supported by over 50 years’ experience, are the best choice. 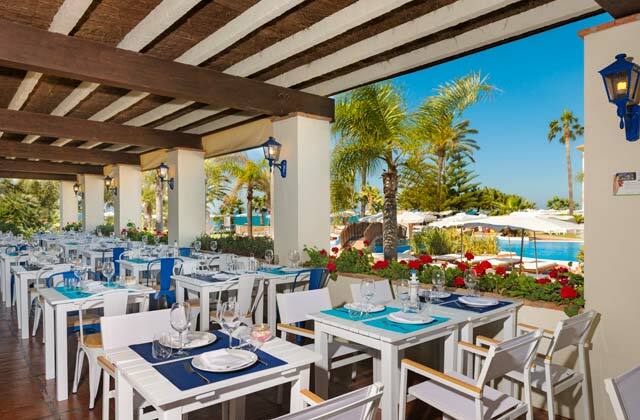 Marbella, Conil, Grazalema, El Rompido, Estepona or Torrox are some sites where you can find these great places to stay and enjoy good Spanish cooking. 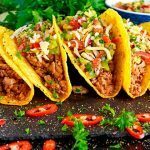 Where can I find a recipe for the Pork in Beer version? I didn’t find much success looking online for this variation.